Canada’s QUEEN of fashion, Jeanne Beker, is guest curator for an upcoming exhibit at The Design Exchange on the intersection of politics and fashion! The exhibit covers political fashion from 1960 to the present including a paper dress covered with Pierre Trudeau’s face during the Trudeaumania days, fur coats splattered by PETA, skinhead fashion, and a few pieces from Jeremy Scott’s Arab Spring collection. 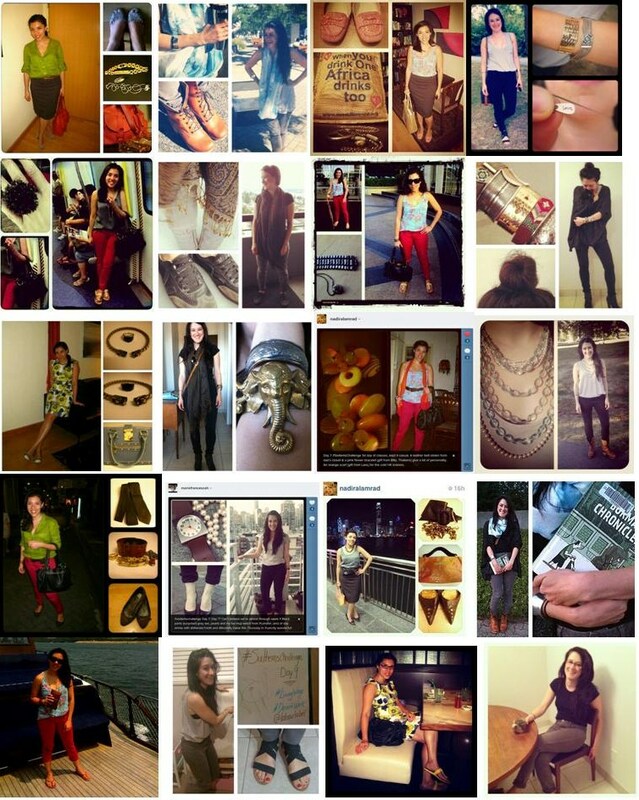 This exhibit is definitely on our #fashionbucketlist next time we’re in Toronto! Politics of Fashion | Fashion of Politics runs from September 18th – January 25th, 2015. This entry was posted in Cultural, DESIGN, DESIGN, Events, Exhibition, HIDDEN NARRATIVES, Political, Responsibility, Social, SOCIETY on September 16, 2014 by Nadira Lamrad. 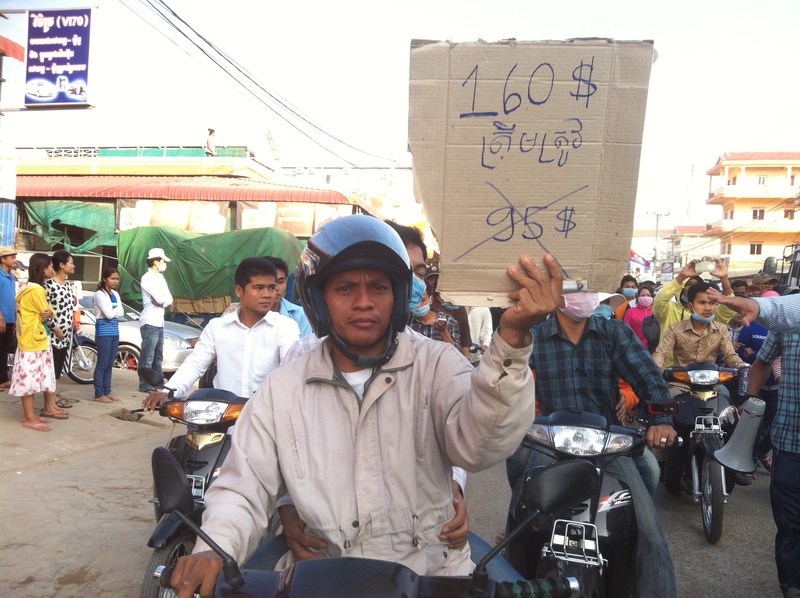 A worker’s sign demanding $160/month minimum wages | Image taken at a rally by Mu Sochua, a Cambodian opposition party MP [click the photo to go to her blog]. 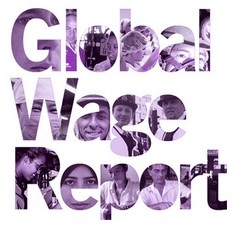 Last week, Mary reported on the violent protests in Cambodia which included garment workers who have been demonstrating against a proposed minimum wage increase to US$100/month. 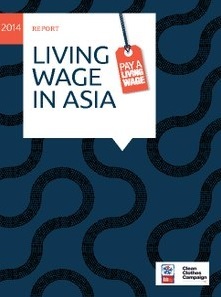 The workers have asked for US$160/month which still falls short of the living wage proposed by the Asia Floor Wage Alliance [see the report entitled Latest Asia Floor Wage figure in Local Country Currencies (2012)] of KHR 1178814.60/month which is equivalent to something between US$283-294/month, depending on the exchange rate. The protests continued over the week culminating in 5 deaths and around 40 injuries when authorities opened fire. Meanwhile, the Garment Manufacturers Association of Cambodia (GMAC) estimates sales losses of US$200 million and project a 30 per cent drop in orders in 2014 due to the protests. GMAC, in a press conference, condoned the military police’s reaction to protesters, and blamed striking workers for all deaths which were described as “collateral damage”. Today’s news reports (see also here) confirm that the protests are suspended (for now) as unions advised workers to go back to work. Union leaders plan a meeting to regroup and rethink their protest strategy. Sithi.org uploaded an open letter from some brands to Prime Minister Hun Sen, the Cabinet of the Prime Minister, the Council of the Ministers, the Chairman of GMAC and union leaders calling for a peaceful resolution of this conflict and expressing deep concern over the violence writing further that “[o]ur primary concerns are for the security and safety of the workers employed by our suppliers and the long-term stability of the Cambodian garment industry.” The brands added “[w]e believe that the only way to resolve this dispute is to cease all forms of violence, and for stakeholders to enter into good faith negotiations, allowing workers to safely return to work without fear of repercussions as soon as possible.” Kudos to the signatory brands: H&M, Gap Inc., Inditex, Adidas Group, Puma, Levi Strauss & Co., and Columbia. Finally, to add an international political economy dimension to these protests, there is a report (see also here) that details the South Korean embassy’s involvement in back channel dealings pressing the Cambodian government to protect Korean interests. South Korea was the largest investor in Cambodia in 2012. This story is ongoing and we’ll do our best to continue the updates on a regular basis. In the meantime, keep up with events over our Fb page and our twitter feed. This entry was posted in Cambodia, Freedom of Association, Harassment or Abuse, Human Rights, Labour, Responsibility, SOCIETY, Supply Chain, Wages and Benefits and tagged Cambodia, garment workers, living wage, minimum wages, protests on January 8, 2014 by Nadira Lamrad. On January 17, 2013, Kate Fletcher will present at Emily Carr University in Vancouver, Canada, through the TD Speaker Series/Designer in Residence Program. This event is free and open to the public but you must register your place online – space is limited! This entry was posted in DESIGN, ECOLOGY, EDUCATION, HIDDEN NARRATIVES, Responsibility, SOCIETY and tagged Centre for Sustainable Fashion, Education, fashion, fashion design, Fashion Design Education and Social Responsibility, Kate Fletcher, Slow Fashion on January 2, 2013 by Mary Hanlon. Will you be in London this Friday, Oct. 26th? 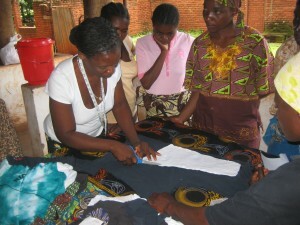 Mayamiko Trust is holding a fundraising event for their efforts in supporting women in Malawi through training and education, with all proceeds going towards building a skills and production centre. 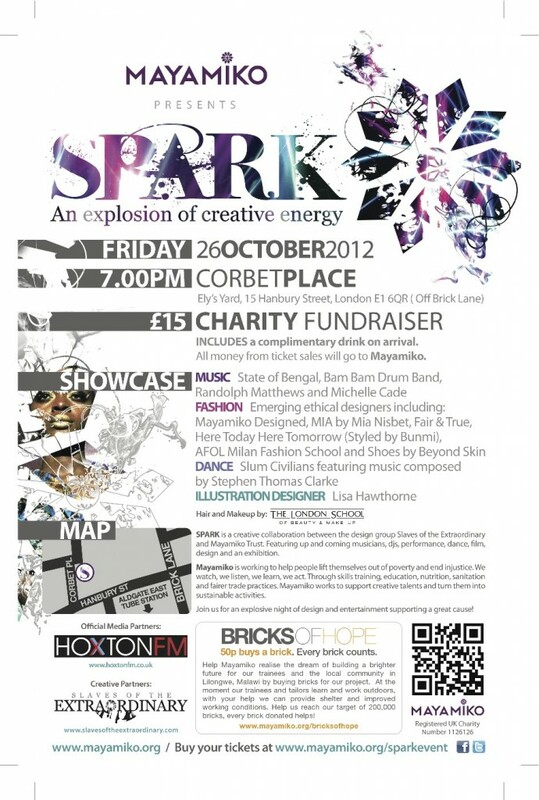 ‘Spark’, a creative fundraising event, will be held at Corbet Place, London (just off Brick Lane) on Oct. 26th at 7:00pm. The night will feature responsible designers, musicians, performers and artists. 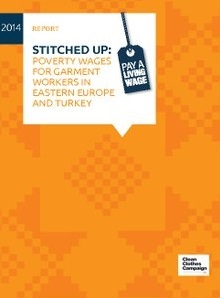 Here Today Here Tomorrow (one of our featured ‘Projects for Change’ – right sidebar) will be showing work at the event. Sounds like an amazing event! Good luck! This entry was posted in Responsibility, SOCIETY on October 24, 2012 by Mary Hanlon. Will you be in Vancouver, Canada, on October 19th? Mary will be speaking at ECO Fashion Week this season, alongside Tara Sawatsky (Canopy), Martin Hojsik (Greenpeace International), Carly Stojsic (WGSN), Myriam Laroche (Eco Fashion Week), Katharine Shipley (Our Social Fabric), Mark Sklazeski (SustainU), and Melissa Ferreira (Adhesif Clothing). 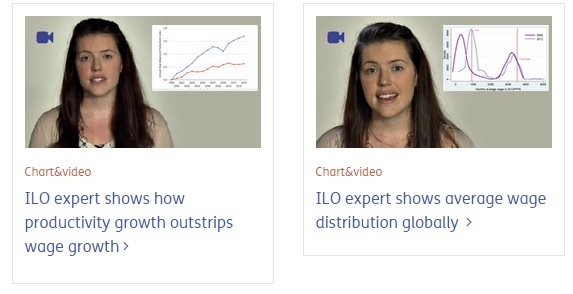 Click here for more information on the SMART TALK line-up. The seminars are free, but you’ll need to register in advance to hold your place (limited seating). If you’ll be there, please make sure to introduce yourself and say to Mary! EFW Season 5 runs from Oct. 15 to 19th, click here to view the entire event details and schedule. This entry was posted in ...AND EVERYTHING ELSE, DESIGN, ECOLOGY, EDUCATION, Responsibility, SOCIETY on October 14, 2012 by Social Alterations. 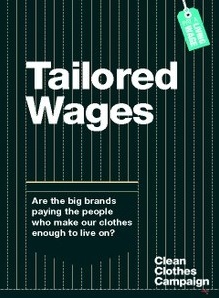 Well, we’re officially 12 days into our 4 week #SixItemsChallenge for Labour Behind the Label. We’ve written up our thoughts and feelings so far with the challenge (trust us that it is a challenge), and hope you’ll pop over to their site to hear about them. Please also check out the stylings and stories of our fellow ‘Sixers’ – they are rocking this challenge and making it look easy! This entry was posted in ...AND EVERYTHING ELSE, DESIGN, DESIGN, EDUCATION, Responsibility, SOCIETY on September 15, 2012 by Mary Hanlon.